The next offering of the Master Pond Manager course will begin August 29, 2018. This Clemson Extension-sponsored program provides management strategies to stormwater and recreational pond owners and managers through an online classroom and hands-on field training. 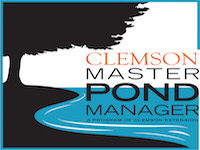 Participants can complete the full Master Pond Manager recognition training, or complete a Letter of Completion in Recreational or Stormwater Pond Management. Participants in the full Master Pond Manager course will receive three Category 5 pesticide CEC hours. The fall 2018 course will host field days in the Clemson, SC area (Anderson and Pickens Counties). See the course syllabus for more information. All are invited to attend. Registration ends August 22nd! Visit http://www.clemson.edu/public/water/watershed/training/mpm for more information and to register.